Peter Moffett, now better known by his stage name Peter Davison, was born on 13 April 1951 in the Streatham area of London. In 1961, he and his family - parents Sheila and Claude (an electrical engineer who hailed from British Guiana) and his sisters Barbara, Pamela and Shirley moved to Knaphill, Woking in Surrey, where Davison was educated at the Winston Churchill School. It was here that he first became interested in acting, taking parts in a number of school plays, and this eventually led to him joining an amateur dramatic society, the Byfleet Players. On leaving school at the age of sixteen, having achieved only modest academic success with three O Levels of undistinguished grades, he took a variety of short-lived jobs ranging from hospital porter to Hoffman press operator. He was still keen to pursue an acting career, however, and so applied for a place at drama school. Davison was accepted into the Central School of Speech and Drama and stayed there for three years. His first professional acting work came in 1972 when, after leaving drama school in the July of that year, he secured a small role in a run of "Love's Labour's Lost" at the Nottingham Playhouse. This marked the start of a three-year period in which he worked in a variety of different repertory companies around the UK, often in Shakespearean roles. He then made his television debut, playing a blond-wigged space cowboy character called Elmer in "A Man for Emily", a three-part story in the Thames TV children's series The Tomorrow People (1973), transmitted in April 1975. Appearing alongside him in this production was his future wife, American-born actress Sandra Dickinson, whom he had first met during a run of "A Midsummer Night's Dream" in Edinburgh. They married on 26 December 1978 in Dickinson's home town of Rockville in Maryland, USA. Davison spent the following eighteen months working as a file clerk at Twickenham tax office. He also took the opportunity to pursue an interest in singing and song-writing, which led him to record several singles with his wife. He later provided the theme tunes for a number of TV series, including Mixed Blessings (1978) and Button Moon (1980). Davison played the romantic lead, Tom Holland in Love for Lydia (1977), a London Weekend Television (LWT) period drama serial transmitted in 1977. Davison's greatest acting breakthrough came when he played Tristan in the BBC's All Creatures Great and Small (1978), based on the books of country vet James Herriot. It was a highly successful series, which ran initially for three seasons between 1978-1980. His success in All Creatures Great and Small (1978) brought him many other offers of TV work. Amongst those that he took up were lead roles in two sitcoms: LWT's Holding the Fort (1980), in which he played Russell Milburn, and the BBC's Sink or Swim (1980), in which he played Brian Webber. Three seasons of each were transmitted between 1980 and 1982, consolidating Davison's position as a well-known and popular television actor. In 1980, Doctor Who (1963) producer John Nathan-Turner, who had worked with Davison as the production unit manager on All Creatures Great and Small (1978), cast him as the Fifth Doctor in the series. Taking over from Tom Baker, who had been in the role for an unprecedented seven years, Davison was seen as a huge departure as he was by far the youngest actor to date. Davison announced he was taking the lead role in Doctor Who (1963) on the BBC's lunchtime magazine program Pebble Mill (1972) on 3 December 1980, when he discussed with the presenter a number of costume ideas sent in by viewers and was particularly impressed by a suggestion from one of a panel of young fans assembled in the studio that the new Doctor should be 'like Tristan Farnon, but with bravery and intellect'. His appearance in The Hitchhiker's Guide to the Galaxy (1981), was recorded on 19 December 1980 and transmitted on 2 February 1981, by which time the viewing public were well aware that he would soon be taking over the lead role in Doctor Who. There was in fact only a month to go before he would make his on-screen debut in the series - albeit a brief one, in the regeneration sequence at the end of Doctor Who: Logopolis: Part Four (1981). His first full story was in Doctor Who: Castrovalva: Part One (1982), the first story of season nineteen transmitted on 4 January 1982. Another significant change for the series was that it was taken off Saturdays for the first time, instead being broadcast on Mondays and Tuesdays. Davison was an immediate hit as the Doctor, with ratings picking up considerably from Tom Baker's final season. Several episodes from Davison's first season achieved over 10 million viewers, which would be the last time these numbers would be achieved in the original run of Doctor Who (1963). One particular success from Davison's first season was the stylish return of the Cybermen in Doctor Who: Earthshock: Part One (1982), which became the most popular Cybermen story since the 1960s. As the incumbent Doctor, Davison took part in the major celebrations of the 20th anniversary of Doctor Who (1963) in 1983, which included the multi-Doctor special Doctor Who: The Five Doctors (1983). Nevertheless, Davison had found himself dissatisfied with his second season on Doctor Who (1963), feeling that the writing, directing, budgets and tight recording schedules in the studio were frequently letting it down. He also feared typecasting in one role, so he decided to leave the series at the end of his third season. He left at the end of Doctor Who: The Caves of Androzani: Part Four (1984), which is still regarded as one of the all-time classics. Davison became a father when on Christmas day 1984 his wife gave birth to a daughter, Georgia Elizabeth, at Queen Charlotte's Hospital in London. Ten years later, however, his marriage to Dickinson broke down and they separated. Although he has taken occasional roles in theatre, radio and film, most of the actor's work has been in the medium for which he is best known: television. His credits have included regular stints as Henry Myers in Anna of the Five Towns (1985), as Dr. Stephen Daker in A Very Peculiar Practice (1986), as Albert Campion in Campion (1989) and as Clive Quigley in Ain't Misbehavin (1994) all for the BBC, and as Ralph in Yorkshire TV's Fiddlers Three (1991). In addition, he has reprized his popular role of Tristan Farnon on a number of occasions for one-off specials and revival seasons of All Creatures Great and Small (1978). Davison has also returned several times to the world of Doctor Who (1963). 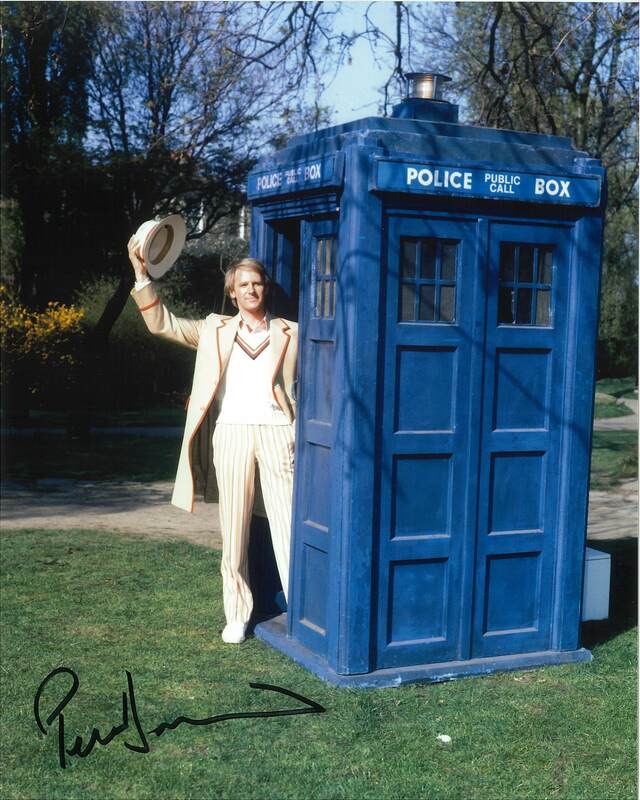 In 1993 he appeared as the Fifth Doctor in Doctor Who: Dimensions in Time (1993), a brief two-part skit transmitted as part of the BBC's annual Children in Need Charity appeal, and in 1985 he narrated an abridged novelization of the season twenty-one story "Warriors of the Deep" for BBC Worldwide's Doctor Who audio book series. In addition, he has appeared in a number of video dramas produced by Bill Baggs Video. In 2003 and 2004 he appeared as quiet and unassuming detective 'Dangerous' Davies in The Last Detective (2003), the Meridian TV adaptations of Leslie Thomas's novels.